I saw this Mazda 3 on Work Emotion CR-Kai’s a few weeks back and it really reminded me why I was so heavily considering these wheels along with RPF-1s. The look really suits the Mazda 3 and the color these have been powder coated really helps them stand out among the many black and white versions that are floating around. The owner also recently made the switch from BC’s to KW VII’s as well which brought the car down some more giving it that perfect ride height. He's also got a vinyl covered roof to mix things up a bit. 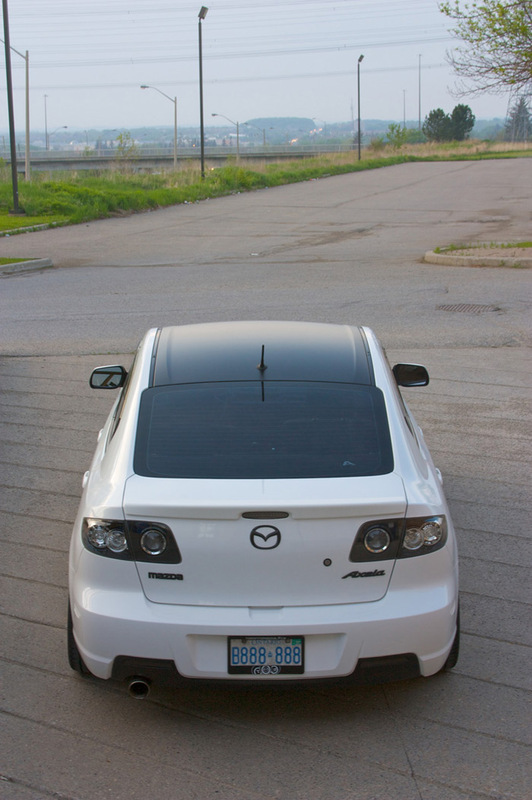 Spotted on Toronto Mazda 3, photo credits to the owner. Thanks for the feature Dave! The BCs were slammed in the rear but the fronts had about .5″ of threads left. My KWs (I think, if the internet is correct) are almost at the lowest setting in the rear, but I have a lot more room to drop in the front. Great color choice Justin. The steep contrast is eye catching. Glad to see you didn’t try to tint your windows to match your wheels! I have actually seen this done (over kill!!!). Looks clean. Congrats justin on a gorgeous ride, love the wheel colour & Roof looks amazing too. Sorry for the noob question, but what’re your wheel nuts? I’ve got the same JDM Ego dust covers however the nuts just look stunning matching them.